Christchurch’s tower controllers no longer have to sit in a large cupboard at the top of the stairs using closed circuit TV to see bits of the outside world. A modern—real—tower allows them to do their job much better. Hugh Mitton reports. What Makes a Good Airline Pilot? After a widely varied flying career, Brian Hope offers his thoughts—based on a lifetime of experience in the airline industry—on some of the important qualities that make a good airline pilot. As more and more aircraft appear fitted with winglets of various kinds, Mike Friend, who has had a lot to do with designing and building these clever devices, explains what all the fuss is about. 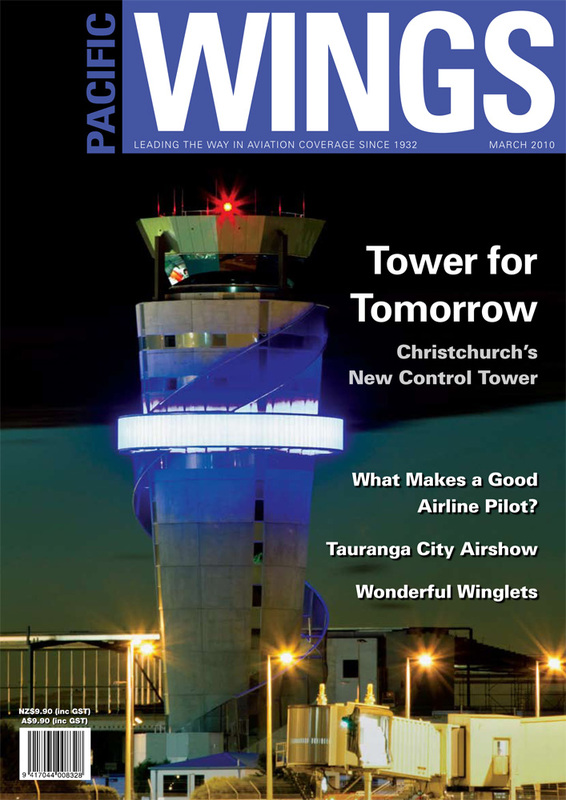 Diane Jeffrey reports on the recent Tauranga City Airshow. In the last issue, we featured the story of Derek Erskine’s first aviation “survival” story—his WWII fighter pilot days. In part 2, we tell the story of his survival of New Zealand’s early topdressing years in an industry that claimed many lives. Veteran combat helicopter pilot—now a civilian, but still flying in a war zone—Don Harward talks about helicopters and the journey of life.